Nova turning products, now distributed in the UK by Record Power, have a reputation for quality and innovation. Their chucks and Nova DVR variable-speed lathes have certainly garnered a lot of favourable comments. 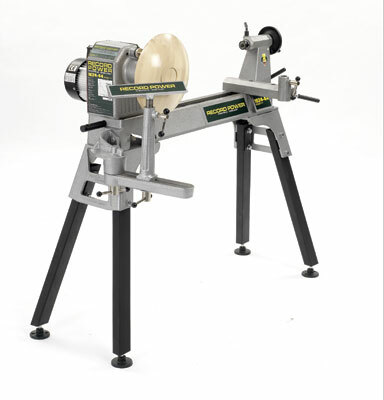 The Nova 1624-44 eight-speed manual belt-change lathe is new to the UK market but has been available elsewhere in the world for some time now. I have had the opportunity to use the lathe on the Continent and it is nice to see its introduction here. The introduction of a manual belt-change lathe in a market that is seeing a surge in sales of variable speed lathes may be surprising to many, but may actually be a flash of inspiration. Many lathes had three-to-four-speed ranges on manual belt-change lathes that created some interesting situations when turning out of balance or larger turnings, where one needs to adjust the speed regularly to cope with the ever-changing balance dynamic of the piece as it is turned. Often micro speed adjustments are needed and four speed changes simply will not afford one that flexibility. The eight speeds on this lathe, ranging from 178-3000rpm provide a wider speed range with greater control and, of course, let's not forget that a manual-speed lathe is less expensive than an electronic variable speed one, thus making it a potentially more affordable option to a wider group of turners. The construction of this lathe is based upon the popular Nova DVR. All of the major lathe parts are cast iron, and a heavy construction at this stage bodes well for stability when turning. As with the DVR it is supplied as a 24 inch-between-centre lathe and can be extended, if necessary, by buying a 510mm bed extension which bolts onto the end of the existing bed. This can be done multiple times should one need an extra long lathe bed. It sports a 1.5hp motor, so is able to deliver the all the 'oomph' you may require. It is no use having a lathe that is nice and stable, and has a decent turning capacity only to fall at the last hurdle by not being able to deliver the power to make good on its promised potential. It is supplied as a bench-mounted lathe, with 16in turning capacity over the bed, and an outrigger option enables turnings up top 29in diameter. The headstock can be rotated through 360 degrees should it be required, which if one is into turning table tops (or other large diameter work) allows the user to have the spindle pointing over the end of the lathe so a floor standing rest can be used. To gain full advantage of this facility mounting a lathe on a bench is not the best idea, mainly because most benches are shoddily built. Fortunately, a leg set option is also available. The headstock has an integrated 24-position indexing unit, which makes drilling, carving and other forms of enhancement a lot easier to perform. The spindle is a 1 1/4inch x 8 and has a no 2MT in both headstock spindle and tailstock quill. These details reinforce the fact that this lathe - not only because of its solid body construction but also by its large spindle size - can cope with the rigors of large work, but also provides solidity for small, precise work. In reality, one is getting the tried, tested and proven track record of the Nova DVR lathe but with manual speed change instead of variable speed. The operation of this lathe has been well thought out. In truth no matter how well built the lathe, the stand on which it sits is the thing that will help or hinder the lathe's operations and running. So it was pleasing to discover that the additional leg stand set is nicely constructed, and provides a very stable base on which to place the lathe. as I found the ones supplied to be rather short. 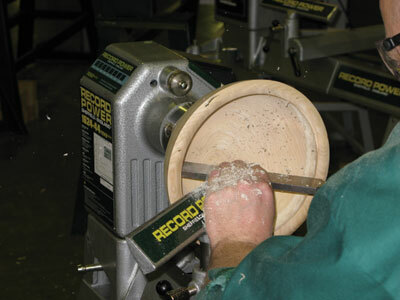 I have turned bowls, hollow forms, platters and many other projects on this lathe and like the smoothness of it. The speed changes are surprisingly quick to enable. Simply undo one thumbscrew on the plate shielding the belts, move the safety flap out of the way, lift the motor and move the belt to the required position. This is not rocket science, it's simple proven technology that is easy to operate, quick and - most importantly - works well. There is a clear plastic strip on the front of the headstock so you can see the belt position and speed at which the lathe is set. The biggest plus with this lathe is that the increments are stepped better than most manual speed-change lathes give. When larger work is out of balance, it needs lower speeds to minimise vibration and this lathe delivers those, with a nice range upward until the maximum speed is reached for the smaller work. We all turn in a similar way but we each have an individual way of working, so I made sure that I used the full range of cuts that I know of to test the lathe, from power profiling cuts to the most delicate of refining cuts. I find that the large cuts test the power delivery and that the finer cuts reveal the flaws (such as spindle bearing error or vibration), but I have to say that the lathe performed as expected - faultlessly. The 24-point indexing facility makes locking off the work a breeze, allowing you to enhance work, take off chucks and drill it with absolute piece of mind and safety. Integral indexing like this one on lathes should be the norm not an optional extra. Other manufacturers please take note. I have one other niggle, this is something probably peculiar to me, but one cannot fail to notice the lathe is from Record Power. The decal logos are everywhere. It does not affect the performance in any way but if it were mine I would probably peel the one off the tool rest for a slightly calmer look to the lathe. a fraction of the price! An interesting strategy that I am sure will be well received. This is a well thought out lathe. For just under Â£800 you get a lot of lathe for your money. This lathe can be used for a huge variety of work and will no doubt last for many years. For many turners it is likely to be the only lathe needed. For those who cannot warrant the cost of the Nova DVR with the electronic variable speed the wide speed range available makes this lathe an excellent option. "Integral indexing like this one on lathes should be the norm not an optional extra. Other manufacturers please take note"